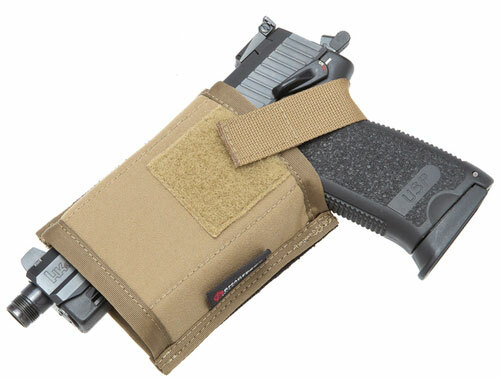 The Armageddon Gear Pistol Pocket is a versatile solution to your security needs. Sticks to any flat surface with the included adhesive-backed Velcro square or to any opposing Velcro field in a gun case, pack or other carrier. Your imagination is the only limit. Accepts any service/duty sized handgun such as the Glock 17 or Sig P229 or similar. Removable retainer strap keeps pistol in place while you're doing J-turns, PITs, or other crazy ninja moves in your mom's G-Ride. Like everything Armageddon Gear makes, the Pistol Pocket is manufactured from milspec american-made materials right here in the good 'ol USA. Available in Black, Coyote Brown, ATACS AU, and Multicam.